Looking to do something different with a favorite photo??? Autumn Portraits will create art that you will treasure!! Send Autumn a picture via e-mail or hard copy and she will create something truly special! 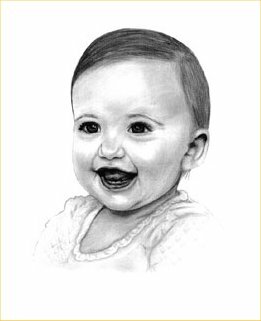 Portraits are drawn on 11x14 or 14x17 paper and you can even order handmade cards or portrait announcements which are all done with love!! turnaround time, memories and more! And don't forget to ask about her holiday special!